Whiplash is a controversial condition not because there is any dispute about its existence but because of the varying ways in which this is handled by the medical and legal system. These some of the tools that specifically trained Physiotherapists use to treat this condition. In more complex whiplash patients there is usually a multi-disciplinary management team required involving Pain Management Specialists (Anaesthetist’s), General Practitioners, Dentist’s, Neurologist’s, clinical psychologists, occupational therapists. 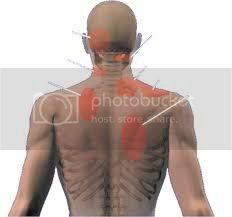 This may involve the use of a variety of drugs, joint or muscle injection procedures or procedures to reduce the sensitivity in nerves so called “nerve blocks”. In these more complex cases it is absolutely critical that all members of the team providing care closely liaise in order to target each component and ensure that the best combination of therapies is provided. Whilst this liaison is important for all conditions it is particularly important in complex conditions where several specialists are involved in providing care at the same time. It is very important that patients understand that all members of the team need to be aware of each others role and to ensure that care is centred around the patient’s best interests. This means that you need to take an active role in ensuring that all members of the team are aware of what treatments are being done, on what timescales and when different clinical reviews are being planned. Whilst many whiplash injuries are simple tissue strains that can subside it can be difficult to determine this in the very early phases of an injury and therefore is important to ensure that recovery progresses satisfactorily and that the physical signs improve as would be expected. If these features aren’t observed then it is important for the clinicians involved in management to recognise this and make appropriate changes to the management plan as required. Simply “hoping” things will settle down in time is like waiting for the tooth fairy. You should expect better than that.